Bestselling writer Jason Aaron (SOUTHERN BASTARDS, Scalped) teams up with artist R.M. Guéra for an all-new series of Biblical proportions in the violent reimagining of the Old Testament in THE GODDAMNED. First announced at Image Expo, the new series will launch from Image Comics this November. "And the earth was filled with violence." Genesis 6:11—It's 1,655 years after Eden, and life on Earth has already gone to hell. The world of man is a place of wanton cruelty and wickedness. Prehistoric monsters and stone-age marauders roam the land. Murder and destruction are the rule of the day. Humankind is a failed experiment. This is life before the Flood. The story of man on the verge of his first apocalypse. Welcome to the world of the Goddamned. In THE GODDAMNED #1, the creators that brought readers the fan-favorite Scalped, reunite for a stark and brutal biblical noir, which begins with a special over-sized debut issue weighing in with 30 pages of story. 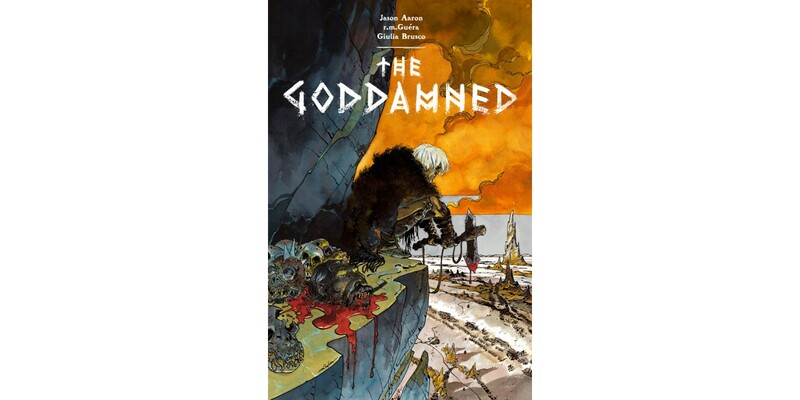 THE GODDAMNED #1 (Diamond Code SEP150529) will hit stores on Wednesday, November 11th. Cover B, featuring art by Jock can be ordered with Diamond Code SEP150530. The final order cutoff deadline is Monday, October 19th.